… through adventures with the Nac Mac Feegles. Looking at the titles of the blog posts over the weekend, it is as if the world had gone on a rampage of sloppy thinking. Sometimes it really does feel like that when I read local newspapers or magazines. 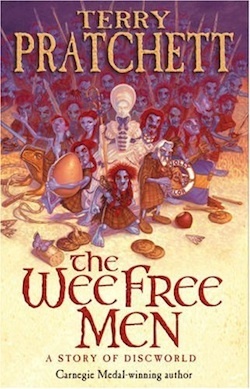 Terry Pratchett’s The Wee Free Men is a children’s book that encourages critical thinking. Tiffany Aching is a hag (witch). Like all true witches she has First Sight and Second Thoughts. First Sight for seeing things as they are, and not as she might want to them to be. Second Thoughts for questioning things. The book deals with other childhood themes. Death. Saving your little brother, even though you’re not sure you really like him. That sort of thing. ‘What does she teach?’ she [Tiffany] asked. I and others at sciblogs have written about the value of critical thinking and have ruminated about how it is taught, both in universities and schools. The passage above reminds me of Larry Moran writing similar thoughts about teaching university students critical thinking of the scientific literature. Colleagues have suggested that the basics should start young. The Wee Free Men seems as good a starting point as any. (Although, of course, you could start the real basics even younger. Little kids ask lots of questions…) It‘s a series,** followed by A Hat Full of Sky, Wintersmith and I Shall Wear Midnight starring Tiffany Aching aged twelve, thirteen and sixteen, respectively. * Teachers are paid vegetables or eggs. ** Reviewers suggest you can read the first three in any order; some suggest the fourth book lacks a backstory connecting it with the earlier books. There is a fourth work, I Shall Wear Midnight, and also recommended. There is too – thank you; Iâ€™d forgotten that one. Iâ€™ll update the post a little later. Slightly related – I have managed to get hold of an audio version of Dawkin’s new book “The Magic of Reality”. It’s aimed, I think, at 12 – 100 years old kids. But I imagine some younger kids could handle it – especially with parental help. Only listened ot the first few chapters but am so far very impressed. It is very thorough and I think is going to be great for the 12 years and up age group. The first chapter deal with evolution type questions (Who were the first people? Why are there so many animals? etc.). I hope later questions outside of biology will get he same treatment. it’s certainly in line as Christmas presents for a couple of my grandkids. Terry Pratchett also has a new book out, Snuff.